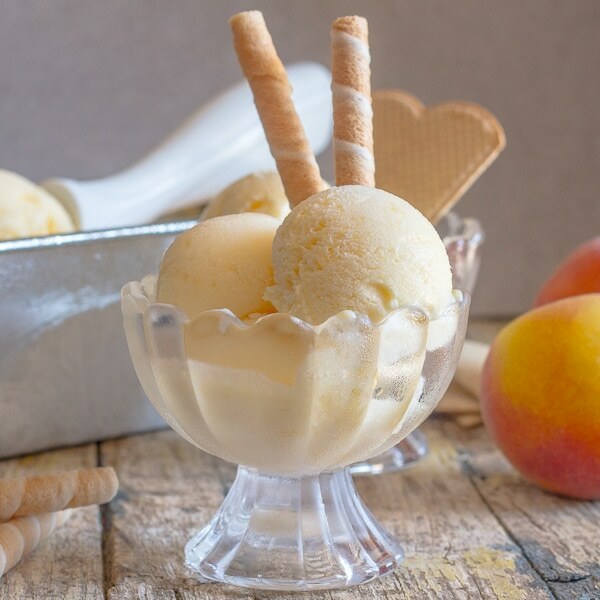 No better way to battle the Summer heat then with A Creamy delicious Homemade Fresh Peach Ice Cream Recipe, everyone will want a scoop or two! Summer fruit! It seems we can’t get enough. If you are like me, you must adore anything and everything peaches. 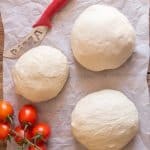 Whether they are cooked, baked or eaten raw. I love them. 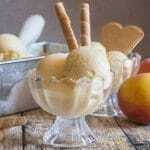 And this Creamy Fresh Peach Ice Cream is one of the best. 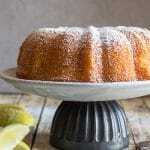 If you are lucky enough to have a peach tree, unfortunately I am not (apricot yes), this is a great recipe to use up some of them. No tree? No problem grab some from your local market or store and get to it. Whenever we go out for a summertime Gelato I am pretty predictable, stracciatella (chocolate chip) and chocolate. Boring to some, amazing to me. 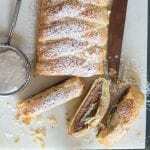 Although the Italian will change it up every time but only with fruit Ice Cream. So this Peach Ice Cream was right up his alley. 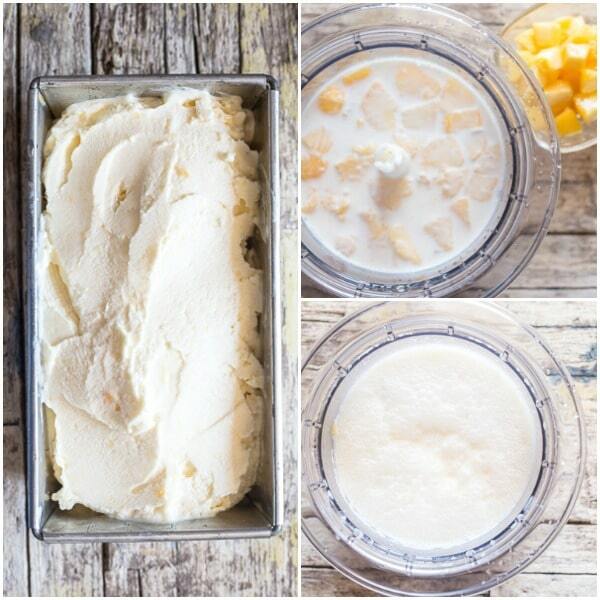 All you need is only four ingredients and an ice cream maker. After a couple of summers of making no Churn Ice Cream, I decided this year would be the return of the ice cream maker. 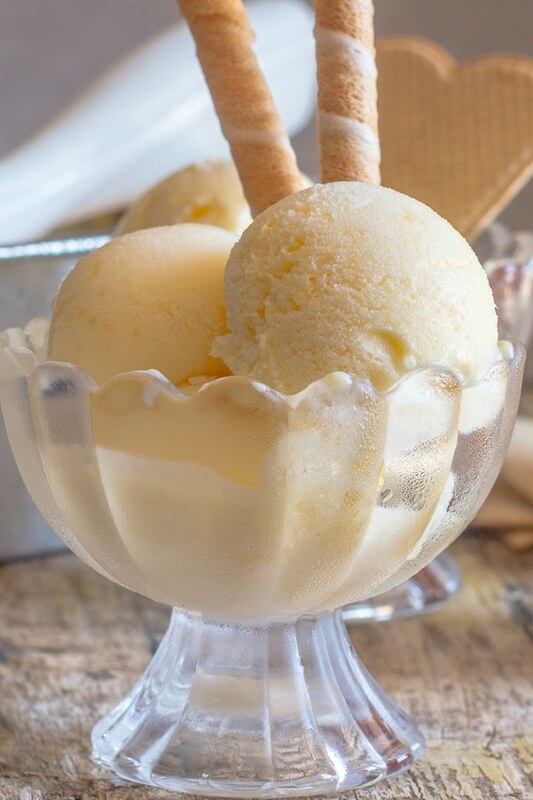 And how about some Pretty Glass Bowls for serving this Creamy Ice Cream in? And I have to say, there is nothing better. Creamy and delicious Ice Cream every time. 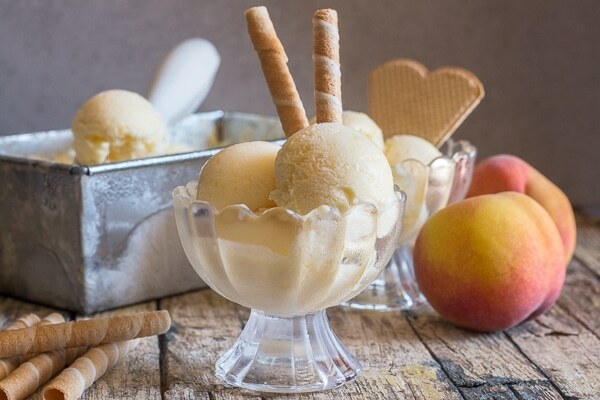 All you need to do is add half the chopped peaches and the rest of the ingredients in a food processor or blender, blend until smooth and then pour into your ice cream maker. Half way through add the remaining chopped peaches and let it churn until firm. 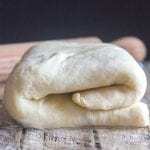 Some like to eat it right away but personally I prefer to freeze it for about an hour or two or until really firm. 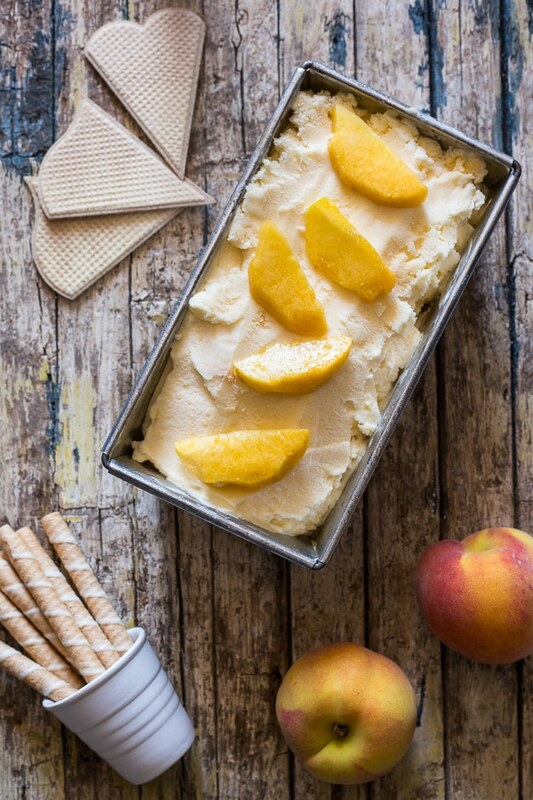 However you eat it, I hope you enjoy this Fresh Peach Ice Cream. In a blender or food processor add half the chopped peaches, milk, cream and sugar and blend until smooth. Pour into the ice cream maker**, halfway through (depending on the instructions of the maker / mine took about 15 minutes) add the remaining chopped peaches and continue until firm. 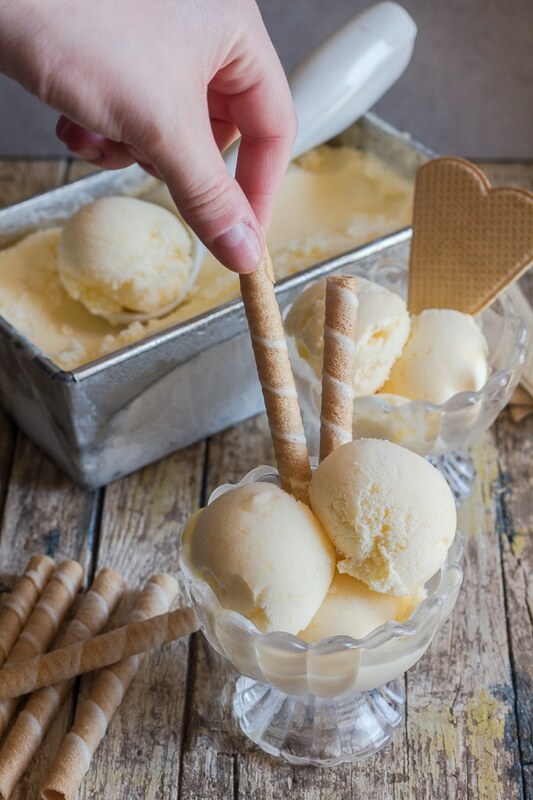 Ice cream can be served immediately or placed in the freezer for extra firming for approximately one or two hours. Enjoy! **Read ice cream maker instructions before use.